Samsung Galaxy X: Samsung's fold-able phone. 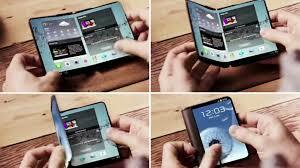 Samsung's mobile boss has said the company is aiming to launch a bendable phone in 2018, assuming it can overcome some problems. Additionally, we've heard that its model number might have popped up in a Korean filing. We could be just a bit closer to release after all. Foldable phones are coming – it’s only a matter of time – and it's looking increasingly like Samsung could be the first company to commercially launch one, possibly as soon as this year. This clearly wasn’t a commercial product, but later that year Samsung launched a concept video of a fully bendable (and transparent) mobile device, that could fold out from a phone-sized screen to a tablet-sized one, showing Samsung's ambitions for the technology. Then in June “people familiar with the matter” reported that we might see two foldable phones from Samsung in 2017 - backing up those previous Galaxy X reports. And talk of a 2017 launch hasn't died. In late 2016 we heard rumors that a foldable Samsung phone would launch early the following year, followed by another later in the year. One of these was said to have two displays with a hinge in the middle, while the other will apparently have a single flexible screen. More recently we've heard again that the Galaxy X will arrive in 2017, but not until the second half of the year. According to some sources, more than 100,000 units are going to roll out in the third quarter of the year - though plans for a 2017 launch could apparently be changed.